We call the chart below Midland 101. It tracks four significant numbers over the period from 2000 to date. The red line is the 116% increase in Midland’s own tax charges over this time. Midland uses that money to provide services like road maintenance to households and services like parks and recreation to people. Households increased by 13% but population actually declined by 1%. So you would expect Midland’s costs to increase by something less than 13% owing to this growth. The other factor is inflation represented by the green line (Consumer Price Index) that increased 30% over the same time. 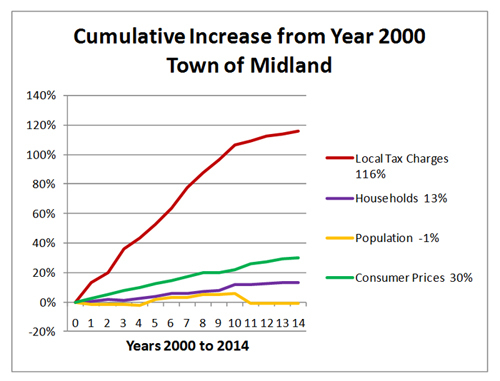 Taking all of this into account, you would expect Midland’s charges to its taxpayers to have increased less than 45% since 2000. That would still have allowed Midland to hire more staff on account of growth and to pay all staff a wage increase each year equal to the increase in the CPI. So why 116%? Midland 101 makes it obvious taxes were on a disastrous trajectory until 2010 increasing far above the rate of inflation. Since 2010 the situation has improved somewhat with recent tax increases now closer to inflation. 2014 is an election year when Midlanders get to decide whether they want to return to runaway spending by their elected councillors or whether Midland needs to be a better place than that. 7 Comments on "Midland 101 – Tax Charges Increase"
I have previously intervened in utility regulatory hearings. This is when a monopoly service (gas, electric) submits an application for a rate increase, and affected groups/those with special expertise have an opportunity to question the data and evidence of the applicant directly before the deciding tribunal. 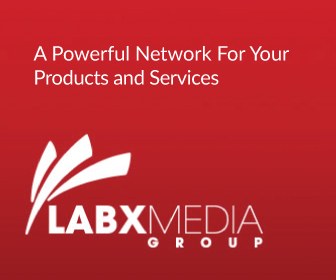 One of the funding formulas used by the regulator at the time (applicable for mature ie not rapidly expanding growth utilities) incorporates what this blog is highlighting. Unusual items (one time or volatile) were placed into what was referred to as “deferral accounts” to reflect variations out of control of the utility (say the water level of reservoirs used to generate hydroelectric power in the case of an electric utility). Surpluses and deficits in these accounts (equivalent to say title searches in the case of a police service) were kept outside of the main OMA budgeting for reasons highlighted elsewhere in the comments on this blogsite. Of course one of the challenges of the intervenors/regulator was ensuring that the base (current) OMA was prudent and reasonable (ie staffing levels were appropriate) before entrenching them into the funding formula going forward. Why it was useful to review the existing budget/structure on occasion (every few years) in some detail on a zero based budget exercise. So, what this blog highlights (the gap in curves) is not unlike what would be presented on a larger scale in similar utility undertakings. And would attract a lot of questions and interventions. And ultimately changes. Wow. Once you review the budgets over time, can you make a chart or something that speaks to what departments have been responsible for the greatest percentage change over that time period. I see that the local tax has been sky-rocketing but need more details about why and what dept(s) have caused the increases. It is too ambiguous right now. Hopefully the chart that you included with this email will get into the paper so Midlanders will see what you are saying. It is really important for people to see this ridiculous increase. We certainly have noticed the increase since we arrived in Midland (Tiffin By The Bay) in 2000. Taxes increasing double in that “short” time!!!!! Thank you again for all the info that you send out, and for all your efforts. Let’s hope we can make a BIG change at the next election!!!!! I sure hope Midland finally gets the elected Government they deserve and those tired old artifacts finally get voted out of office and are forced to live on their generous pensions. If the people of Midland vote for the same tired old gang again they have no one but themselves to blame. Good work Roy and Stewart. one thing I hope is that Midland stays with its own police force, I am willing to pay for that, I am not willing to pay for us to compete in flower and garden competitions (communities in bloom) or to pay for the town purchasing the Uniman property with no idea how to use it. The town desperately needs to find a draw for the area. Tourism yes, but they used prime waterfront for homes and condos so they blew that idea. I find the current council out of touch, with the exception of J Charlebois, a completely new crew of councillors is needed with new ideas. Old ideas simply don’t work in our town. Thanks Dave, for you comments. We certainly welcome bigger and better thinking in order to get Midland back to work. As for your Policing comment, we think we need a plan around an expanded and perhaps different looking service model. We currently spend over 25% of the Town’s annual budget on Policing costs and there’s little indication that future cost increases are manageable given the fact that 90% is tied to wages and benefits. When you add that to the fact Midland experiences virtually no new tax monies from growth, we find ourselves in a bit of a conundrum. Be that as it may, hopefully Council and the Police Services Board (PSB) can set aside their differences and put a responsible plan in play. Finally, the former Unimin property boasting some 3300′ of waterfront creates a tremendous opportunity to create a draw for the area. Getting this right will serve all Midlanders well. One positive note is that the rate of increase of property taxes has slowed over the past few years because Council is beginning to bring spending under control. I will be looking for candidates in the upcoming election who can convince me that they will continue and accelerate this trend.